In the fall of 2016, a seed was planted for Tripp Frey, the CEO of Caledonia-based Revolution Farms. 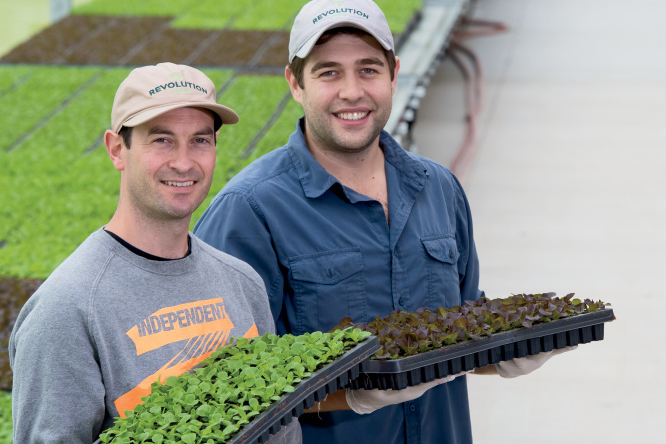 Although he didn’t come from an agricultural background, Frey has an entrepreneurial spirit, and after connecting with some colleagues who taught him about indoor farming and aquaponics, he was hooked. Revolution Farms is an aquaponics farm, meaning they grow produce hydroponically – without soil – while also raising fish. “We grow in a greenhouse and take advantage of sunlight. The fish are there to provide nutrients to the plants, so we feed the fish and convert the waste. It’s the same as if you used manure in a field as fertilizer. 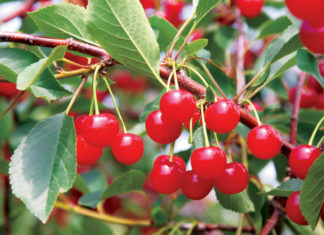 We’re just doing it in water using sophisticated filtration and design,” Frey says. 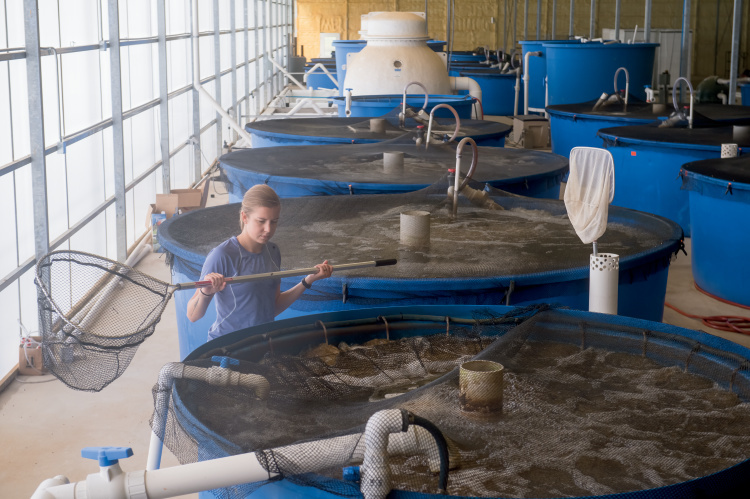 The farm raises tilapia, and for produce, they currently have five different varieties of lettuce. The plan is to sell single- and mixed variety greens, along with whole fish, to grocers and food services. 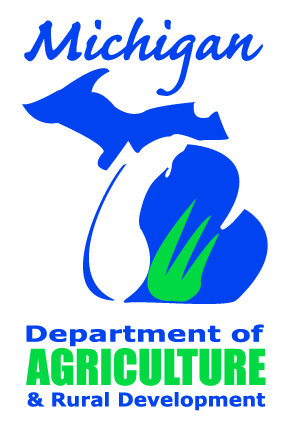 The company received a $50,000 grant from the Michigan Department of Agriculture and Rural Development to help with initial costs. Frey says it’s the first grant they’ve presented to a startup company, which was a great honor for Revolution Farms. 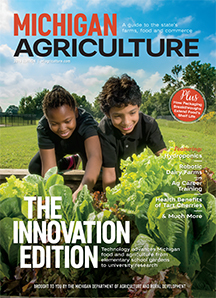 As for the aquaponic growing method, Frey says it has several benefits, both for consumers and Michigan’s food and agriculture industry. “We’re growing a local product, which means the consumer is going to get a fresher, more nutritious product, and I think that’s important,” he says. “Also, indoor farming and greenhouse growing is the future of agriculture. We have a growing population and need to figure out how to feed everyone. This method allows us to be very efficient with our space and we can grow twice as fast.” He adds that aquaponics can help the economy as well, providing more jobs for Michiganders and getting fresh food into the hands of those who need it the most or may be food insecure. Mastronardi Produce/SUNSET® has become a pro at greenhouse growing. The national company has a location in Coldwater and produces some of the freshest tomatoes, cucumbers, peppers and more in large greenhouses. Different from traditional growing and hydroponics, Mastronardi uses sustainable, reusable growing mediums such as rockwool. It’s a man-made fiber that carries less bacteria while still being extremely absorbent. 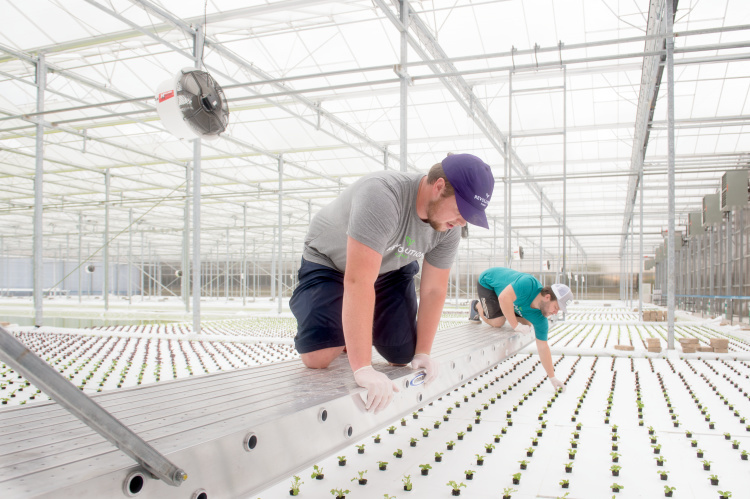 The company’s greenhouses are placed strategically across the country to provide the freshest produce available, using up to 10 times less land than produce grown in fields. Even better, the company can grow year round, so consumers enjoy off-the-vine tomatoes even in the off-season. Though it’s on a much larger scale, Mastronardi is similar to Revolution Farms in that sustainability is a top priority. The company’s entire water supply is UV treated and recycled, and fed through drip irrigation, allowing plants to get the right amount of water. The control allows Mastronardi to use up to 10 times less water than traditional farms.